DilutionUse straight out of the can. If necessary, dilute with water. Diluting Chroma Key paints may make coverage less even. ApplicationStir contents before use. Do not shake. Apply by brush, roller, or spray gun. Apply in thin, even, uniform coats, using a good quality brush or roller. Use overlapping strokes, keeping a wet edge. Change roller direction often to avoid patterns and streaking. Average Dry TimeAT 75°F, dries to the touch in 30 minutes. Can be re-coated in 1-2 hours. 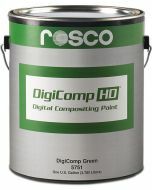 Intended for DigiComp HD paint, but can also be used as a guideline for regular Chroma Key paint.